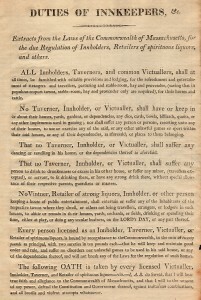 Historic Deerfield Inc recently acquired a broadsheet from about 1810, issued by the state of Massachusetts, entitled Duties of Innkeepers. We are in dereliction of quite a few of these duties – we fail on the no dice and cards about the house, we definitely allow dancing and revelry, and we are sorry, but there is quite a bit of drinking and playing on the Lord’s Day. We do well in not suffering minors to drink, and we can’t abide disorder and misrule. We are all in favor of no hostility and violence, but we fall short on providing hay and provender – although the 1883 stables are still in good order! This broadsheet will eventually be on view in the Barnard Tavern, one of Historic Deerfield’s museum houses, once that restoration-in-progress has been completed. While we may veer from these traditional “duties of innkeepers” at our Deerfield bed and breakfast, we like to think these changes leave a little more room for fun! Experience the best of historic Deerfield, MA and join us!